Yesterday tomatoes, today garlic (... and what do you think, tomorrow basil?). Yesterday I gave you Neruda, today you have to deal with myself. But don't worry, I won't pass you any Ode to Garlic that I wrote, also because, to be honest, I'm not really a big fan of it. To clarify, I find places such as The Stinking Rose, with their best sellers like garlic martini or garlic ice-cream, a little intimidating. What can I do? 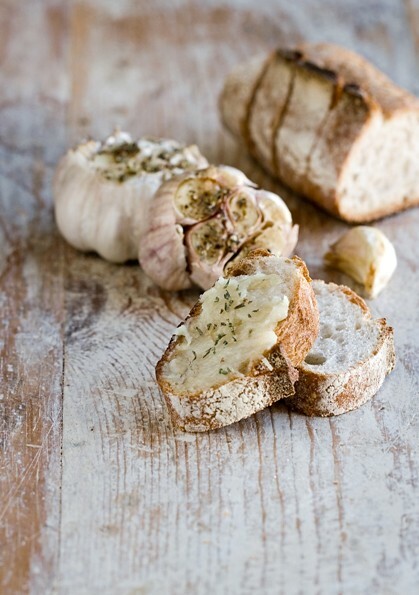 Yet, even garlic, usually so harsh, pungent, and even a little fetid, deep in its heart has a creamy, soft, and sweet soul. You just need to know how to rub him up the right way, and you'll see that even if he's mad and furious, you can shut him up. Slice off the top of the garlic heads, about 1/4 inch from the top, but without separating the cloves. Place them on a baking pan, season with salt, pepper, and fresh thyme sprigs, and drizzle with olive oil. Bake at 375 for about 45-60 minutes, until garlic gets soft. If it darkens too soon, cover it with a sheet of aluminum. If necessary, pour some vegetable stock in the pan, so that garlic won't stick to the bottom. Once cooked, squeeze the cloves one by one and you'll get a sweet and totally innocent cream. It's excellent as an appetizer, spread on top of crostini, along with a slice of brie or other semi-soft cheese. And if you find yourself eating a whole garlic head, don't say I didn't warn you. we all bee aware of media is a fantastic source of facts.